William Shatner, Leonard Nimoy and the rest of the U.S.S. Enterprise crew take to the skies in one of the most acclaimed and intriguing Star Trek adventures ever. Awards: Nominated for Best Cinematography; Best Sound Effect Editing; Best Sound; Best Score-Leonard Rosenman. DVD: Widescreen 2.35:1/16x9; audio English DD 5.1 & Dolby Surround, French Dolby Surround, subtitles English; closed-captioned; single sided - single layered; 17 chapters; rated PG; 118 min. ; $29.99; street date 11/9/99. Maybe I'm just a complete contrarian, but I continue to find myself in the minority opinion about the Star Trek films. Oh, I agree with the general consensus for the two best - II and VI can't be beat - but my support of the much-derided pictures V and Generations keeps me from the mainstream. I'm going to go in an opposite but also potentially unpopular decision about 1986's Star Trek IV: The Voyage Home. This film usually appears in the top rankings of Trek pictures, and it seems to be easily the most popular with casual fans of the series; it's received such a large audience due to the fact it's much more light-hearted and comical than most of the other pictures. IV generally is called the "accessible" Trek. Unfortunately, that easy spirit that lets so many non-fans enjoy the film makes it less and less palatable to me as time passes. ST IV is one of those movies that I initially liked but that seems to age poorly; with each additional viewing, I find myself less and less enchanted with the picture. There's just something about the forced humor of the story that wears on me. Trek humor tends to be broad and unsophisticated and most of its appeal comes from the fact it's the Enterprise crew reading it; it's the incongruous nature of the lines that make them (ostensibly) funny. That kind of humor doesn't hold up well over time, especially since many of the jokes in IV seem dated; unlike the show itself, the movie appears welded to the middle Eighties and hasn't made a strong transition into future generations. One other hallmark of its era is the rather preachy environmental message of the movie. I'm all for saving the whales and other initiatives, but IV really seems heavy-handed in its treatment of the cause. Everything's spelled out so explicitly that it quickly becomes exceedingly tiresome. Trek works best when it's subtle, but the producers of this film have no faith that viewers will get their message unless they beat us over the head with it. I could forgive those problems, however, were it not for the movie's most fatal flaw: the presence of Catherine Hicks as marine biologist Gillian Taylor. Hicks offers one of the all-time annoying performances. She emotes her lines horribly and stands as a thoroughly unlikeable character. There's nothing in the role that makes it so; it's all from Hicks as she seems in a permanent snit. Hicks performance is so miserable that she almost single-handedly ruins this movie; she makes Gillian one of the least-appealing characters I've seen. Star Trek IV is not a bad film, but I really feel the high esteem with which it's regarded is misplaced. It's a fun experience the first time around, but it's an artificial high that decreases significantly with every rescreening. Only the existence of the absolutely miserable Star Trek: The Motion Picture keeps Star Trek IV from residing firmly at the bottom of my Trek rankings. Star Trek IV: The Voyage Home appears in its original theatrical aspect ratio of 2.35:1 on this single-sided, dual-layered DVD; the image has been enhanced for 16X9 televisions. Although this is undoubtedly the best the film has ever looked in a home video release - it's greatly improved over the 1991 laserdisc - the picture presents quite a few problems that ultimately result in quality that's just about average. Sharpness is one concern. While the picture often seems pretty crisp, it also frequently tends toward softness for no apparent reason; the vagueness isn't extreme, but the image simply looks "off" too much of the time, even during daylight shots, which should come across the most clearly. Moiré effects appear only rarely - generally when we see usual culprits like grates or blinds - and the few jagged edges occurred due to the anamorphic downconversion on my 4X3 TV; these happened but not with any high level of frequency. Print defects mar the image mainly during effects shots, especially if there's a composite. At those times, we see fairly high levels of speckles and grit, whereas these issues are not a substantial concern during other parts of the film. Some grain intrudes at other times, but not to a significant degree; it's really only the effects shots that have problems. Colors generally appear accurate and natural, but a fair amount of oversaturation intrudes at times. The biggest culprit stems from intense red lighting on some starship bridges; the picture does not handle this well, and the tones are runny and smeared. Some intense yellow tones also cause problems during shots on Vulcan; essentially, the film appears able to handle more pedestrian colors, but when the intensity increases, the image runs into problems. The general smoky murkiness of starship bridges also creates picture flaws. These images often look rather fuzzy and ill-defined. Black levels tend to be adequate, but shadow detail - especially in these starship shots - can be pretty thick and overly dark. While this DVD undoubtedly does a better job with the picture than any previous effort and still seems at least average, I nonetheless must admit I was a bit disappointed with it; the image sometimes looks quite good, but the overall flaws make it not as strong as I think it should have been. More satisfying is the Dolby Digital 5.1 soundtrack of ST IV. The forward soundstage is very broad but nicely spatial, with convincing imagery that places audio in specific spots but blends it together nicely. The surrounds aren't tremendously active, but they add to the experience with some effective backing, and we even hear some decent split surrounds on occasion. Sound quality seems pretty good. Dialogue appears largely natural and clear, although some edginess and slight distortion occasionally occurs. Effects also are realistic and clear, with some nice punch at times; the audio that accompanies the probe seems especially rich and strong. The score appears quite bright and vivid, with depth as well. The only exception happens when the crew enter San Francisco and the track switches briefly to "modern" music; those parts lack bass and seem flat in comparison with the rest. Despite the age of the mix, ST IV manages to offer a very satisfying audio experience. ST IV's light on supplements, but it's more packed than any of the other Trek films to date. 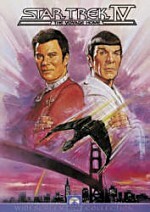 The main attraction is a nine and a half minute featurette with director Leonard Nimoy. This piece is mildly interesting as Nimoy discusses his thoughts about directing the film. Most entertaining, though, is the simple sight of seeing Nimoy direct while in full Spock garb. I also enjoyed the "behind the scenes" shots, especially from the interaction between Nimoy and Shatner. Most ironic moment: when Nimoy addresses the importance of watching films in their original aspect ratios, all while the featurette shows the clips in pan and scan segments. It's not a great program, but it's mildly interesting and hey - at least it's something! Finally, the DVD offers the movie's original theatrical trailer. Again, this is a good haul for a Trek film, but I still wish that Paramount would eventually release some nice special editions of these movies. Recommendation time, and this is a tough one. I'm a Trek fan and also a completist, so it's a no-brainer for me - and for others like me - to own this DVD. However, the fact remains that I don't honestly much like Star Trek IV, and since it seems to offer more and more flaws with each rescreening, that doesn't bode well for a purchase. The DVD provides very good sound but the picture is a real disappointment, and the supplements don't add much to the package. Leave this one for Trek completists only.